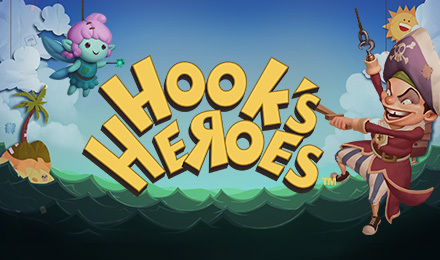 Hook's Heroes Slots has 96.82% RTP | Play & win now! Hook’s Heroes Slots is a fun and adventurous video slot game! There are generous bonus features and an RTP of 96.82%! Ahoy! Spin to win today! Hook’s Heroes Slots will take you on an adventure on the seas, having you dancing to some cool Caribbean music, and of course winning big! Captain Hook himself is your Wild and can replace other symbols to create winning lines. Be sure to also look out for the game’s Scatter, which will grant you loads of FREE spins! Plus, with each FREE Spins Bonus, you can choose an Extra Feature with multipliers, added Wilds and more! Login and play now!